Greengages Lodge01263 715779work01603 870304fax Self-cateringNestling in a peaceful hamlet in a quiet corner of the Norfolk Broads, this cosy cottage is ideal for couples wanting a relaxing break. The Broads has lots to offer lovers of the outdoors, including walks, cycle rides and boat trips. Back at the cottage, guests can enjoy the owner's wood and orchard, or relax in their own private garden. • Pets: One small well behaved dog welcome - please refer to our booking terms regarding pets. • Luxuries: TV with DVD/Video player, CD hi-fi, Radio. WiFi. • Mobile signal weak except Vodafone which is variable. Nestling in a peaceful hamlet in a quiet corner of the Norfolk Broads, this cosy cottage is ideal for couples wanting a relaxing break. The Broads has lots to offer lovers of the outdoors, including walks, cycle rides and boat trips. 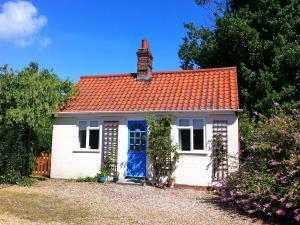 Back at the cottage, guests can enjoy the owner's wood and orchard, or relax in their own private garden.